Since 1998 the Syros Summer Workshop on Psychoanalytic Psychotherapy Studies has become a living tradition. 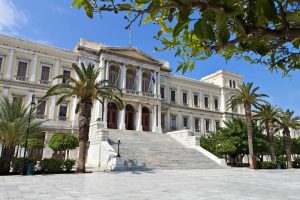 The Workshop combines Greek island summer weather with psychoanalytic studies and takes place in the neoclassical building of the Hermoupolis Town-Hall in the Cycladic island of Syros. It is organised by the Hellenic Association of Child and Adolescent Psychotherapy under the auspices of EFPP. From the first Workshop (May 1998), EFPP and IPA members from all over Europe have been joining this event in this sunny and picturesque Greek island of the Aegean Sea. Successful Workshops of the past enjoyed the presentations of invited speakers, like: Margot Waddell (U.K.), Jean Begoin, (France), Gianna Williams, (U.K.), Imre Szecsody, (Sweden), Roberto Basile (Italy), Luc Moyson (Belgium), Serge Frisch (Luxembourg), Prof. R.D. Hinshelwood, Majlis Winberg Salomonsson (Sweden). All presentations (theoretical and clinical) are discussed in small Anglophone and Francophone groups and then they are reported back to the plenary for a general discussion. The high quality of presentations in the plenary meetings and the exchange of ideas in the discussion groups, have always been characterised by a friendly atmosphere, the same atmosphere that has accompanied us after each day’s work to the seaside and the local tavernas. This is perhaps one of the reasons that most of the Syros Summer Workshop participants come back for the next event. This year we invite you to the 10th Syros Summer Workshop 2nd-4th June 2017. The themes of the workshop will be: ‘Struggling with Integration’. Our key-note speaker this year is the British Child and Adolescent Psychotherapist, member of ACP (Association of Child Psychotherapists), U.K. Ann Horne. The title of her talk would be Children who use the body to cope with trauma: activity, gaze and the space for thought. Athanasios Alexandridis, M.D., PhD (Psychology), Child and Adult Psychiatrist, Training Analyst of the A.P.F., the H.P.S. and the I.P.A. The title of his presentation is: ‘Shame through the body’. 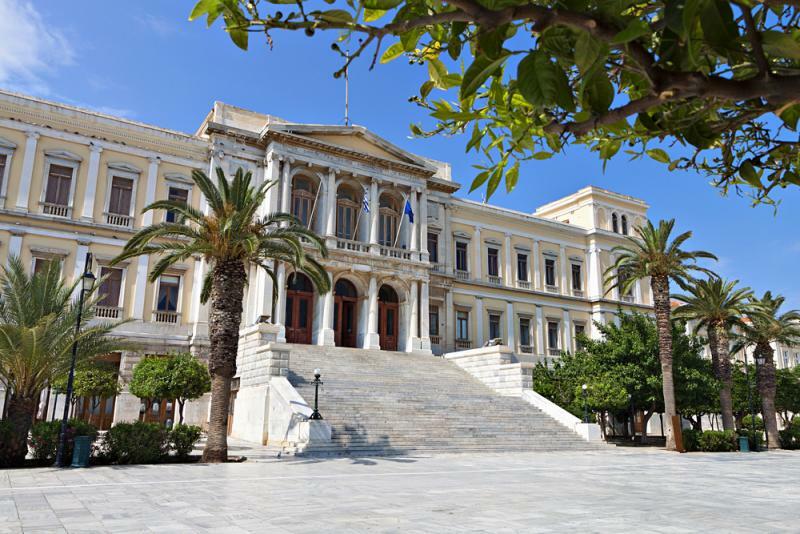 We look forward to welcoming you to the familiar premises of the historic Town-Hall building in Hermoupolis Syros, 2nd – 4th June 2017. The participants have to share the expenses for the invited speaker, secretarial assistance and other administrative expenses. The total cost will be 180 Euros per person. Conference fee needs to be paid upon registration in order to secure participation. All Syros Summer Workshop arrangements are handled by Mrs. Mary at Teamwork Travel Agency in Syros. Mary, our local Syros workshop “correspondent”, will be able to take care of all your travel arrangements, and provide all the necessary details. She is amazingly helpful, friendly, very efficient and experienced. Please contact her through email at mary@teamwork.gr or phone. As the number of participants is limited (25), we cannot secure a place unless you register promptly.